With 13 volunteers at the project there is plenty of time for extra jobs. 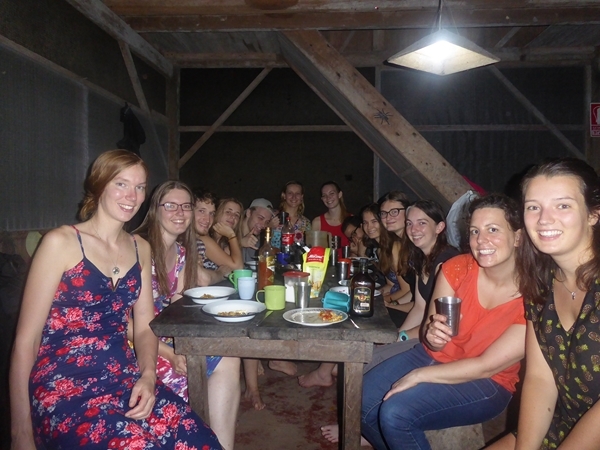 The head volunteer moved into her own place (the cabin) recently, after a successful ‘housewarming’. There has also been plenty of time for enrichment projects and construction jobs. 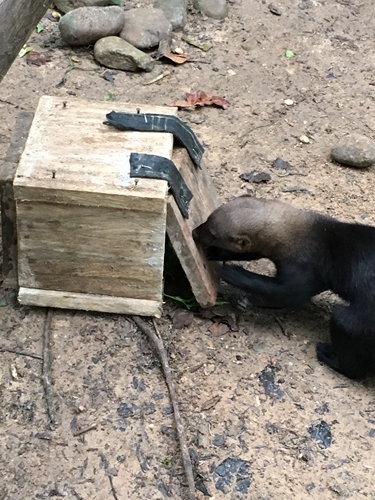 Some recent examples of enrichment are: a puzzle box for Ruena (female tayra), a football for the spider monkeys and a construction with sticks that encourages the birds to work to get the seeds hidden inside. 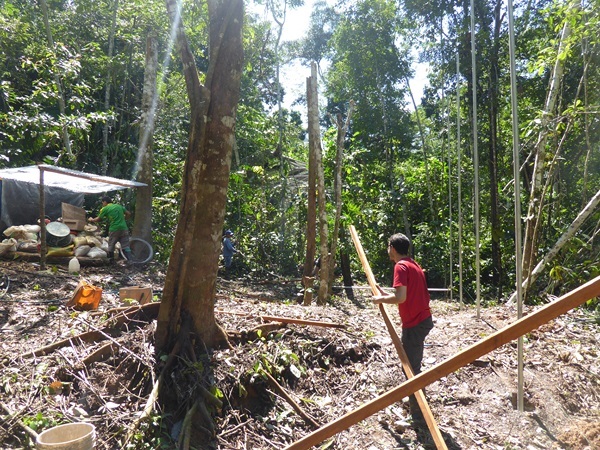 Everyday some of the volunteers are on construction duties. 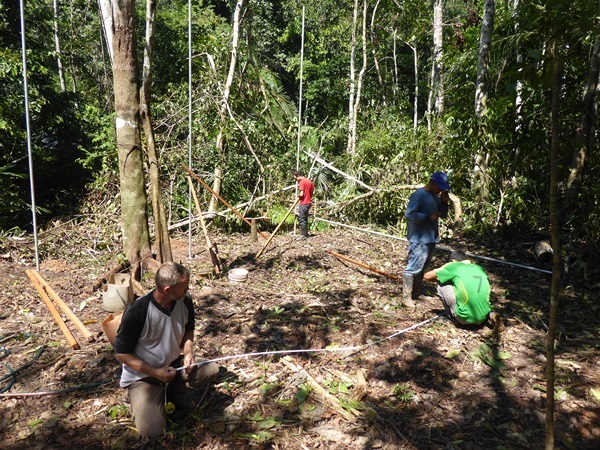 These volunteers help Douwe and the local workers with whichever construction is currently the priority. This can range from cutting iron tubes to fit their purpose, to carrying sandbags to where they are needed. Most of the volunteers have also had the opportunity to go on a jungle walk with Machico, where he demonstrates his immense knowledge about plants and trees. Unfortunately, at this moment Machico has had to take some time off due to a personal loss. Our thoughts are with him at this difficult time. Preparations for the construction of the new quarantine area have begun. The area has been cleared, sand is being collected, and the materials have been ordered. We hope to lay the foundations soon. Simultaneously a new space has been cleared out for another enclosure, thanks to the donation of Lush Cosmetics. In the last year they have already financed the reptile pond, the TUPAK-release cage and the deer enclosure. This new enclosure will be named after Elmo, one of the sloths, that has been successfully released back into the wild. At Esperanza Verde we often encounter incredibly smart animal behavior, which makes us believe that the animals are very aware of their surroundings! Sure enough, as soon as we started clearing out space for the ´Elmo´ enclosure, Elmo showed up high in one of the trees, almost as if he knew what was going on! 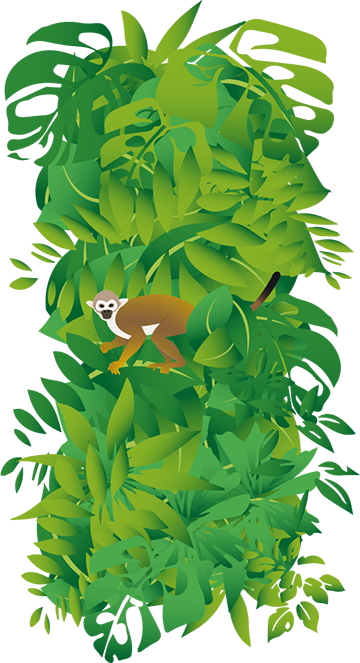 This enclosure will be similar to the big spider monkey cage (Rimaq). A project that was recently finished is the beautiful painting of Asan (blue-yellow-macaw) on the storage building wall. Although it was sometimes difficult to paint with monkeys around (they like to get their fur painted blue and green!) it has turned out to be a great success. Everyone at Esperanza Verde really appreciates the new sight, a big thanks to Janick from Switzerland! 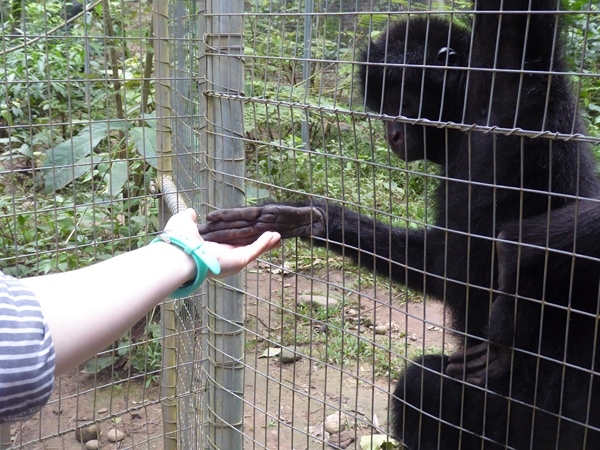 Rimaq, one of our enclosed male adult spider monkeys, was found to have a small cut on his hand. The treatment of this minor injury has been going very well. 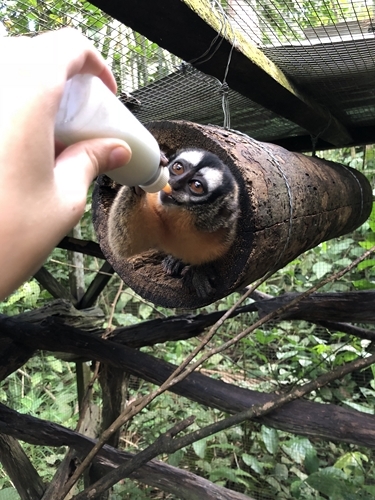 In the mean time, one of our volunteers who has experience with training monkeys in her job (Rachel Henson from Monkey World in UK) is teaching both the spider monkeys to respond to a ‘clicker’ and introducing them to positive reinforcement training. Luna and Otis, the young female and male night monkeys are doing very well. Recently, we decided to stop feeding Otis milk separately. Before, we always fed Otis milk from a baby-pet-bottle. But since he seems old enough now, we´ve tried to start feeding him from a bowl. This has worked out very well. We are excited to see how fast these monkeys are becoming independent. 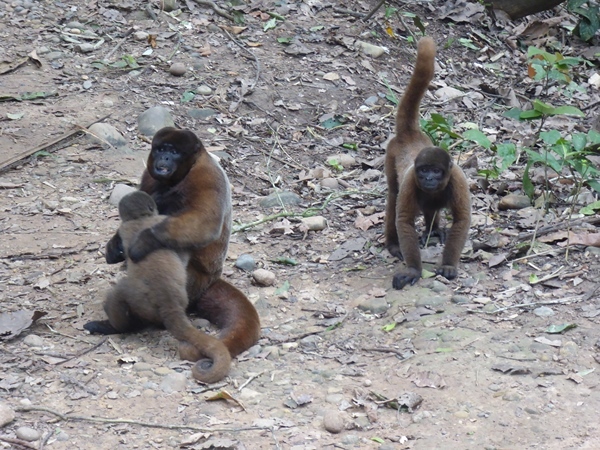 It won’t be long before we can let them out to join Sira (our adult female night monkey). 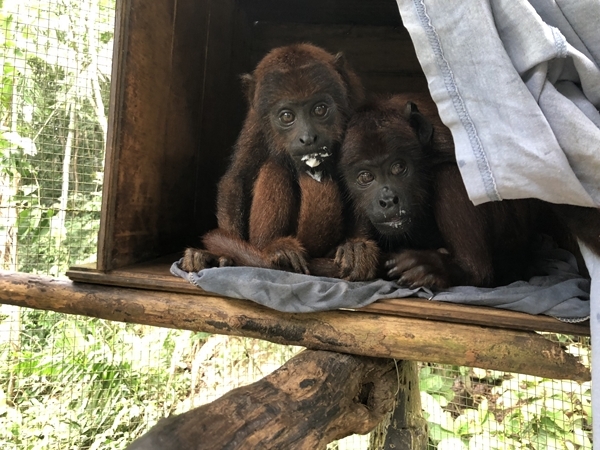 As for the howlers, Darwin and Kaya, have also been doing very well. Cesar, however is looking somewhat less healthy. He does not drink as much milk as his companions and sometimes refuses to eat. Some poo samples were investigated but unfortunately the reasons for this strange behavior remain unclear. He was looking very skinny so we have to carefully watch how much he is eating and how he is behaving. After some treatment he does seem to be a bit more active and he has started eating a cereal mix with extra proteins instead of his regular milk. Due to all the construction work going on it has been hard to find time to continue the walks with Ruena (female juvenile tayra). We have managed to squeeze a few walks in and hope to do more of it soon. Luckily, we have enough volunteers who can keep her busy with enrichment projects, like the puzzle box mentioned earlier. 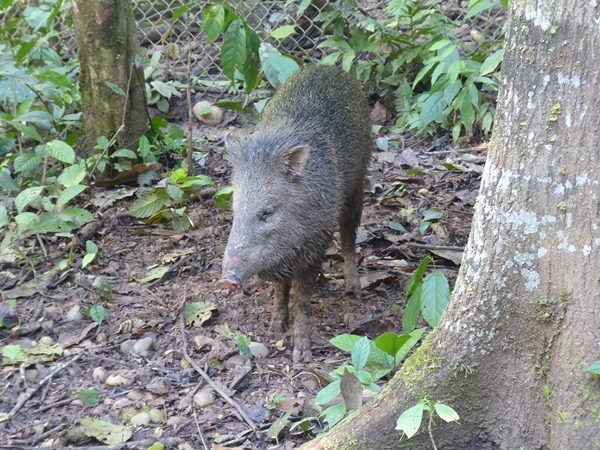 Quintisha (female adult collared peccary) was doing better with the antibiotic treatment. First she stopped breathing heavily and then she bled a bit from her nose only occasionally. The decision was made to stop giving her antibiotics, but after a few days the bleeding returned. Shortly afterwards, the heavy breathing also worsened and she was anesthetized to perform a better investigation into her nose. Unfortunately the cause of the bleeding was not found. Antibiotic treatment has been restarted and she has been moved to another cage temporarily to be able to treat her better. Koru, the purple gallinule bird who was recently introduced to the aviary, seems to be delighted to be there. He is eating more and more from the food we give him, but has also been spotted eating insects from the ground often. 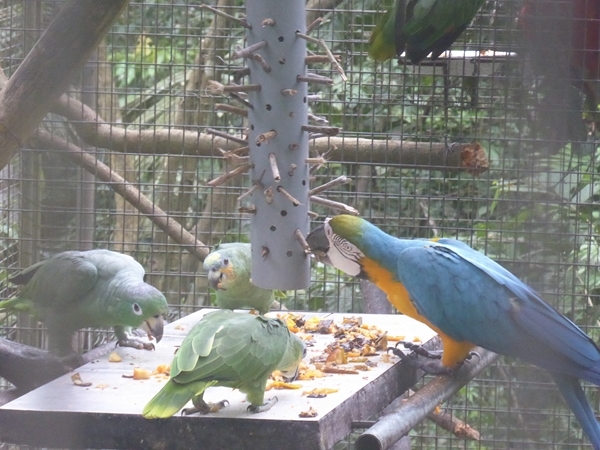 Due to volunteers calling for him, some of the parrots have developed the habit of yelling Koru as well, making it easier for us to find him. With some great roommates like these, it seems all the more likely that he will gain a permanent spot in the aviary, “Pichu” cage. For a long time the yellow footed tortoises have been roaming around their residence freely. Even though they all seem as healthy as ever, we decided to organize a tortoise hunt to enable us to count them, weigh them and give them a general health check. 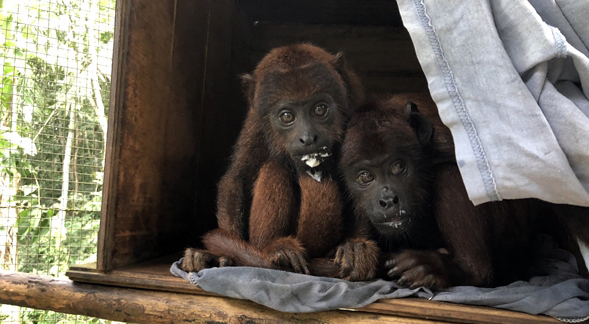 Only Pinto and Aramis, the two smallest ones, were missing, but due to the size of the enclosure it is not surprising that we could not find them! We suspect they might be hiding somewhere. 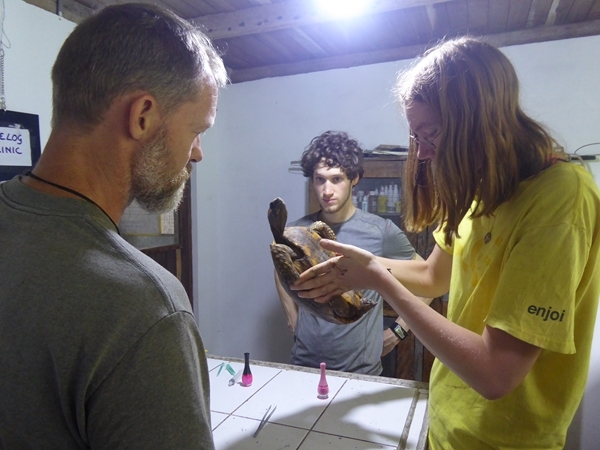 This was also a great opportunity for us to refresh the data we have about the tortoises and we found all of them in good health during the inspection. Unfortunately there is some sad news regarding Ronya, the baby brown capuchin monkey. She was enjoying going on the leaf walks and was becoming more and more trusting, also towards new volunteers. Sadly, she got spooked by something on a leaf walk and decided to run off on her own. Despite the combined efforts of volunteers she knew dearly, she did not come down from the tree she climbed into and spent the next nights outside. For a while we hoped she was rescued by the local capuchin group, but she has not been seen since. Although we always hope for the best, we do fear the worst as would not make it on her own, being so small. Ermina, the scarlet macaw, has had a successful recovery period. She has received an identity chip from Lisa, our veterinarian. The spot where her beak was repaired seems to be holding up well and her appetite has been good. Therefore she has been transferred back to the aviary cage again. She spent some time in the front cage at first, and shortly after we put her back into the big aviary with all the other birds. So far, this transfer has gone smoothly and we have not yet spotted any aggressive behavior towards her. 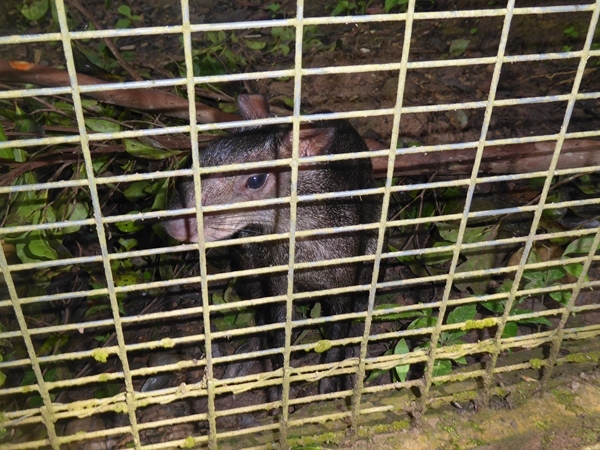 A new mammal we received is a male agouti, Doquino, who was raised as a pet. He was given up into our care as he was becoming too big and started stealing eggs. He spent a few days in the clinic. As this is an animal which enjoys digging for its food, being on a cement floor is not the nicest. So after a health check we moved him in to the empty, more spacious, La Sapa enclosure. With some adequate enrichment and shelter, it is now a nice home for Doquino. 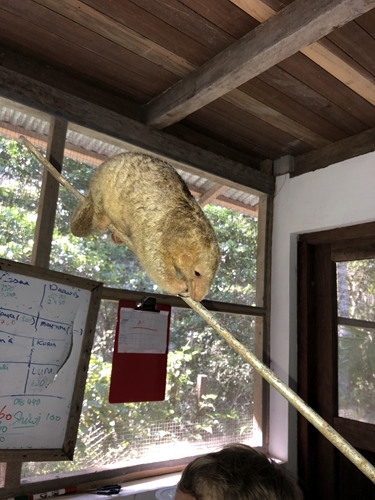 In the hospital but only for a short stay was a pygmy-anteater, captured by some people from Bello Horizonte who were cutting down a tree. Although she has an adorable arrival that made the volunteers go “aww”, she could be quite aggressive. After inspecting her we concluded she was healthy and so we decided to release her into the wild again almost immediately. Sometimes this is for the best as we never want to risk acclimatizing a wild animal to people. But her capture didn’t seem to bother her and she climbed up the tree slowly but surely, enjoying her regained freedom. 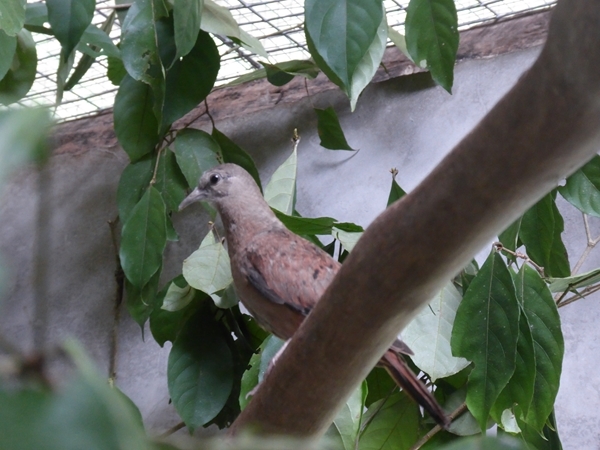 A more permanent cage has been made for two ruddy ground doves that were brought here by one of the workers. Their mother was in a fight with a duck which was trying to get to the young birds. The doves are in between nestlings and fledglings, which is why they still need to learn how to peck food from the ground. Birds as young as these get cold easily and so it is important to provide them with sufficient warmth during the night. Unfortunately, one of the doves did not survive. The other dove, Icarus, is doing very well. The question still remains as to whether we will be able to release it, or if it will be too tame to survive in the wild.